The launch weekend for the new flagship iPhone 5S and colorful iPhone 5C proved to be the most successful smartphone debut ever for Apple, with a record 9 million units being sold in the first three days since September 20. As Apple describes, iPhone 5S and iPhone 5C provide much better smartphone experience than other mobile phones with amazing new features all packed into a remarkable thin and light design, including the beautiful 4-inch Retina display with 1136*640 resolution, brand-new iOS 7, first-class A7/A6 chip, and optimized support to 1080P HD video recording and playback. In a nutshell, the new iPhones will endow Apple fans with top-of-the-line recreation experience thereon. Which Audio and Video Formats Are Supported by iPhone 5S/5C? Considering their high definition, blazing fast performance and great battery life, watching movies or videos on iPhone 5S/5C would be second to none. As we know, there are numerous video/audio formats flooding over the market each day, but only some of them could be played by iPhone. If you want to play videos on your new iPhone 5S or iPhone 5C, you need to find out which audio and video formats are supported by iPhone 5S/5C first. Here, we list the iPhone 5S/5C readable formats for you as below. 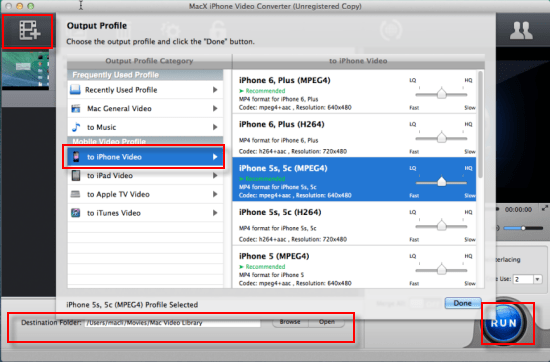 But if you do save some videos that are not in the iPhone 5S/5C supported formats list, please turn to a iPhone video converter for help. No.1 fast to convert MKV, WMV, FLV, AVI, MP4 to iPhone 5S/5C supported video/audio formats and download online videos to iPhones, iPads, Androids devices on Mac and PC. How to Convert DVD Movies/HD Videos to iPhone 5S/5C Compatible Video Audio Format? From the information above, you can know that the videos supported by iPhone 5S/5C are limited to MP4, MPEG-4, H.264. If you want to play classical DVD movies or stunning videos files in MKV, MTS, M2TS or other formats you have saved on your computer on the new iPhones, you need to find certain iPhone DVD ripper or iPhone video converter app to convert DVD movies and videos to video format supported by iPhone beforehand. Luckily, the following software may give you the best solution to rip any DVDs (including the latest copy-protected DVD), convert SD and HD videos to iPhone 5S/5C supported formats. And then, you can sync the DVD movies or videos to your iPhone 5S or iPhone 5C via iTunes for playing anytime. 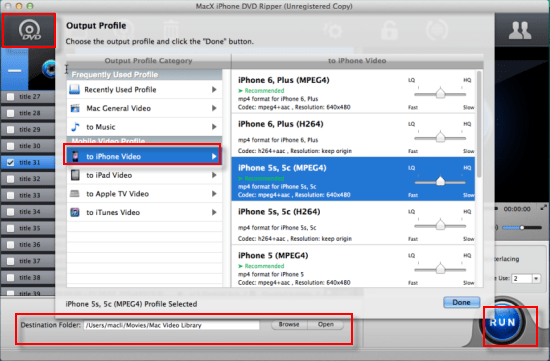 MacX DVD Ripper Pro: top-notch DVD to iPhone ripper for Mac users to rip homemade and commercial DVDs to iPhone 5S, iPhone 5C, iPhone 6/6S (Plus), iPhone SE, iPad, iPod with easy removal of DVD protection like CSS, Region Code, UOPs, RCE, Sony ARccOS, Disney Fake, etc; rip DVD to H.264, MPEG4, MOV, M4V and MP3 etc on Mac without quality loss; cut, trim, crop, merge, add watermark and subtitle to video; extract favorite picture and audio from DVD movies as wallpaper or ringtone. MacX Video Converter Pro: Versatile iPhone video converter for Mac users to convert HD and SD videos including MKV, M2TS, AVCHD, AVI, MPEG, WMV etc to iPhone 5S, iPhone 5C, iPhone 6, iPhone 6 Plus, iPhone 6S/6S Plus, iPhone SE, iPhone 4S, iPad, iPad Mini, iPod, Apple TV, iTunes, MOV, MP4 and more flawlessly with No.1 fast speed and no quality loss; create stunning photo slideshow from photo libraries; cut, trim, crop, merge, add watermark and subtitle to video. What’s the video and audio formats that can be played on iPhone (iPhone 4, iPhone 3GS, iPhone 3G)? Here you will will learn more about the iPhone supported video formats and free Mac DVD ripper & free Mac video converter for transfer DVD movies and video files to iPhone on Mac OS. 2015 the most-awaited iPhone 6S/7 is coming soon! Do you want to purchase one and use it to play video movie thereon with ultra-sharp display? Here illustrates your the answer. Brand-new iPhone 6/6 Plus in hand, but don't know the video audio formats that iPhone 6 supports? Here follow our tutorial and you will know how to play videos on iPhone without format issue.